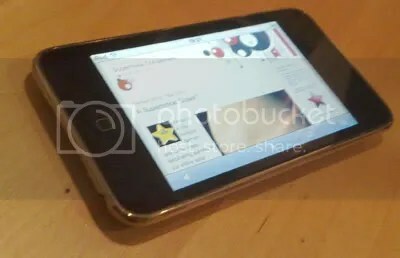 Ok, so I’m not normally much a tech nerd, but I have to say — OMG iPod Touch ultimate geek toy!!! This little beauty was my Christmas/birthday present (I don’t mind a joint present between the two when it’s this cool), and it’s a seriously useful little gadget. Named Mira (because all my electronic widgets are named after stars), there’s a load of miscellaneous software downloadable for it completely free. Even most paid stuff is less than a quid. This isn’t even geekery for geekery’s sake though. These little applications are actually pretty useful in my studies! Aside from having WiFi internet access, I’ve got a no frills Wikipedia app, an RSS reader, a unit converter (for things I actually need like electron volts and wavenumbers), a molecule viewer… even an SSH client to check how my experiments are running. I haven’t actually started setting it up yet, but via WiFi I can even use it to control a powerpoint presentation. Seriously, being essentially an iPhone, sans the actual phone, it’s more like a tiny computer than an mp3 player. When I was a kid, I wouldn’t even have believed something like this could exist, let alone that I might own one. This entry was posted in Imported from Livejournal and tagged technology. Bookmark the permalink.